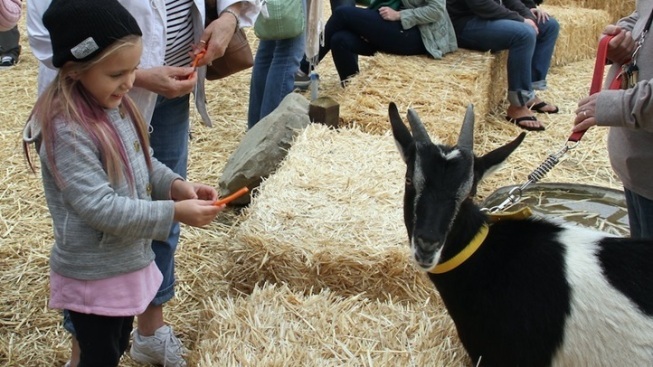 "(E)xperience a day of agricultural learning firsthand" at this free happening. Goat cuteness and more: "(E)xperience a day of agricultural learning firsthand" on Saturday, Nov. 5. PICK ORGANIC STRAWBERRIES... at Camarillo's McGrath Family Farm, or get to know all things avocado during a Calavo Growers visit (that's in Santa Paula). And Ojai Olive Oil will offer samples of cold-pressed olive oil for the tasting, mmm, while some beautiful beasties will be the star of the day at Alpacas at Windy Hill in Somis. Other highlights of the big day out include a peek at the soap showroom at Chivas Skin Care in Fillmore (indeed, goat milk is the famous ingredient) and the squeezing of citrus juice at Friends Ranch in Ojai. Learning is at the center of it all, but chances to pet something sweet and furry, or to sip or nosh on something grown on a property, will be woven throughout. WHERE'S THE HQ... of all of the agri-awesomeness? Oxnard Farm Park, where games, historic tours, live tunes, and beer and wine will add to the convivial fall festivity.